Shiki Ryogi: What's Up, Kokutou! Did you wait too long? Shiki Ryogi: I'm sorry, I took time to get rid of Akitaka. Shiki Ryogi: What? Are you upset because I was only an hour late? You're very impatient, Dude! Mikiya Kokutou: [Shocked] Um... You are Shiki, right? Shiki Ryogi: Do I look like something else? Anyway, we're wasting time here. This, the second instalment in the 'The Garden on Sinners' series is set three years prior to the events of the first story. It shows how Mikiya Kokutou meets, and later befriends, Shiki when they are at school. She is a mysterious girl; it is almost as if she belongs in another time as she wears a kimono and lives in a traditional house. There is also something sinister about her as illustrated in a rather disturbing early scene where she comes across the aftermath of traffic accident. That isn't the only violence; an unknown attacker has been killing people in the city. 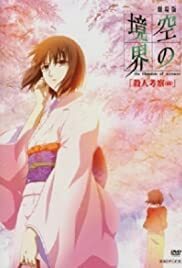 Mikiya learns details about the case from his cousin, who is a detective on the case, and starts to worry that Shiki could be involved somehow. I really enjoyed the opening film but thought this managed to be even better. We learn much more about the characters of Mikiya and Shiki as the story moves on in ways I didn't expect. These details serve to raise many questions about Shiki that should keep one wondering about her character for some time. Once again the animation is stunning; especially during the scenes in a bamboo forest. It is quite violent at times and the descriptions of what the killer does means that it will disturb some viewers. Overall a great second instalment which fans of the series should really enjoy.